Including a new G Guardian and Stand Trigger. Cont (GC) Ritual 3: This card gains Shield+10000. 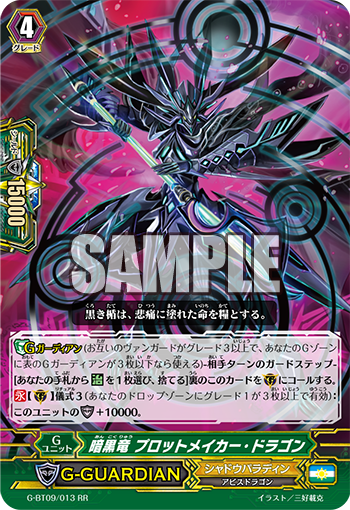 Auto (VC/RC) GB1 Ritual 3: [Choose 1 of your Rear-guards, Retire it] When this Unit attacks a Vanguard, you can pay the cost. If you pay it, during that battle, this Unit gains Power+3000, when that battle ends, your opponent chooses 1 of their Rear-guards, and Retires it. Auto GB1 Ritual 3: When this Unit appears in (RC) from the hand, during that turn, this Unit gains “Auto: When this Unit is Retired from (RC) by your card’s effect or cost, look at the top 2 cards of your Deck, search for 1 of them, add it to your hand, place the remaining cards to the Drop Zone.”. “Dark Dragon, Plotmaker Dragon”, once you’ve achieved Ritual 3 (i.e. there are 3 or more Grade 1 in your Drop Zone), is an iron wall G Guardian who becomes a Shield of up to 25000! With just 1 copy, you can stop most attacks!! And since its Shield strengthen doesn’t have a cost, once you’ve achieved the conditions, it’s always a 25000 Shield. “Knight of Chain Blades, Diarmuid” has an ability that at the end of a battle in which it attacks a Vanguard, it retires an opponent’s Rear-guard. It’s necessary to sacrifice an ally Rear-guard for the cost, but it also gains 3000 Power, which will make sure the attack hits the Vanguard. And even if your attack doesn’t hit, there is the uptick that you can slay an opponent’s Rear-guard. “Knight of the Iron Mace, Craiftine” is a Stand Trigger whose ability activates when you Retire it. During the turn it’s placed on the field from the hand, when it’s Retired by a Cost or Effect, you can look at the top 2 cards of your Deck, add 1 of them to your hand, and place the remainder in the Drop Zone. It cancels out the downside of Retiring it by replenishing your hand! “Divine Dragon Caper” has many cards that support the new 《Shadow Paladin》 clan ability, 【Ritual】. Use 【Ritual】 to seize victory.